BMW's covered cycleway could help cut pollution and congestion in crowded cities. 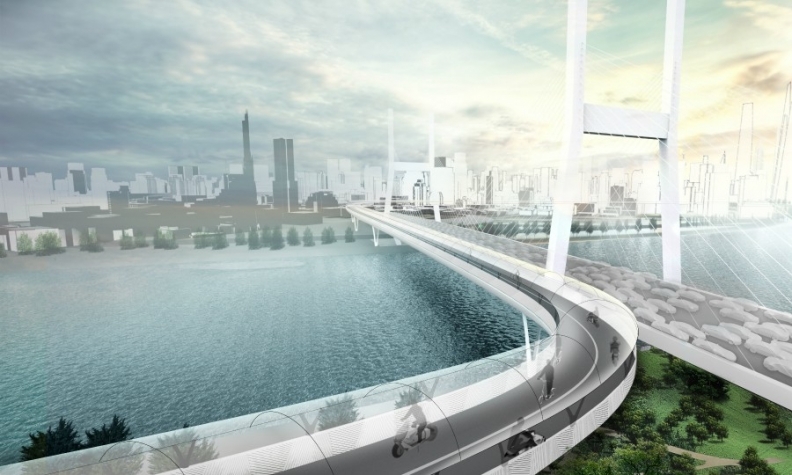 As China seeks to restrict the use of private cars in its congested and polluted megacities, BMW sees an elevated cycleway as a way to encourage commuters to travel around urban areas on two wheels. BMW has come up with a concept that it compares with the Hyperloop tunnel proposed by Tesla CEO Elon Musk. Rather than Hyperloop's high-speed trains, BMW's concept would create a network of covered elevated paths to be used exclusively by e-bikes and electric scooters. The idea is to bring an upmarket element to what is already a popular way of traveling in China by making cycling safer and possible even in bad weather. Riders would rent e-bikes, or pay a fixed fee per distance traveled to use their own bike with payment automatically deducted via cell phones. "We are in the business of providing premium solutions for mobility. This very much fits that brief," Reiner Daude, head of BMW's advanced r&d office in Munich said at the launch of the idea in Shanghai. BMW has called the E3 [cubed] Way for what it says are its three defining characteristics of elevation, electric and efficient. The project was the work of BMW advanced r&d center in Shanghai and Shanghai's Tongji University, which helped with the structural elements. "It's our Hyperloop," Markus Seidel, head of the BMW Technology Office China said, in reference to the Hyperloop One project that aims to connect cities via ultra-fast trains running through tunnels or elevated tubes. BMW has said the project is similarly 'open-source' in that it would require investment from many different parties. However, BMW hopes to collect money via 20 patents it has registered if the project goes ahead, Seidel said. The cycle way would not just help to reduce pollution and congestion, it could mean quicker journeys for people using bicycles or scooters. Weekday congestion in Beijing adds an average 75 minutes to journeys, for example, research collated by BMW showed. BMW and Tongji detailed plans for two routes totaling just over 20 kilometers in Shanghai, aiming to both improve commuting times and giving a city a new tourist attraction. BMW could also rent e-bikes for the routes. The automaker sells a battery-powered bicycle, called the Active Hybrid e-bike with a range of up to 100 km (62 miles) and top speed of 25 kph (16 mph). Earlier this year BMW's motorbike division announced a stand-on electric scooter called X2City to be sold by bicycle and fitness company Kettler. China is already the world's leader for e-bike usage, with around 250 million in use across the country. They account for 20 percent of journeys in Shanghai, data presented by BMW dating from 2014 showed. "E-bikes will become mainstream for short and middle-distance travel," Dandan Wang, BMW project manager for future urban mobility, said. The BMW concept aims to cut production costs by using a modular system of construction in sections that can be built off-site and lifted into place. It could sit below the increasing numbers of elevated roads that criss-cross Chinese cities and utilize their supports to further reduce costs. BMW envisages speed limits would be fixed at 25 kph with speed cameras to enforce that. Regular pedal bikes would be banned in bid to increase safety. The lanes would be accessed by on-ramps built, which could be fitted with barriers to stop further bikes entering if the pathways became too busy. BMW said the paths would encourage more middle-class users onto e-bikes by increasing safety and making it the fastest form of transport over distances of around 15km, beating cars or public transport. It could also be promoted as a tourist attraction, with bridge sections fitted with viewing areas for sight-seeing. The south-eastern Chinese city of Xiamen opened an 8km cycleway for all bikes earlier this year, billed as the world's longest.